I like to focus attention from time to time on alumni. It is fascinating to see where their lives have taken them. Adam Wilson's story is a great read and a true inspiration. My studio in Oberlin at the time Adam Wilson studied with me included many talented young guitarists (Randall Avers, Matt Hinsley, Rami Vamos, David Gohara, Alex Dawe, Josh Millard, and others). By the time Adam graduated, however, he'd decided to emphasize a different pursuit, setting the classical guitar aside for a time, so as might be inevitable, we fell out of touch. 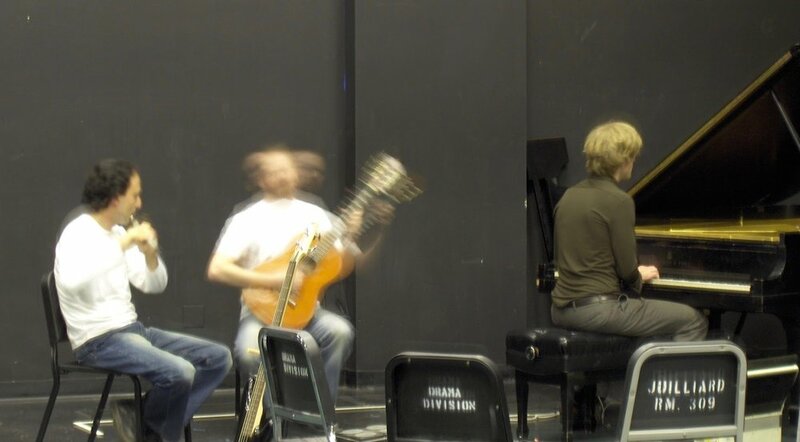 A classical guitar major for most of his time at Oberlin; he graduated in 1997 with a BA. While in the studio, I recall vividly his commitment to new music and his prodigious skills, enabling the programming of big repertoire such as the Villa Lobos Concerto. Since leaving Oberlin, his path has zig-zagged across disciplines and the country, landing him eventually in a professorship at New York City College of Technology, City University of New York. Adam has emerged as a significant player in the specialized arena at the intersection of computers and live music performance, and through improvisation, original compositions, live performances on the fretless electric guitar, and numerous papers and lectures at conferences on the subject, he has become a leader in the field. Not all of Oberlin's graduates become both well-known performers and University professors, but Adam is one of them. "Before enrolling in Oberlin, I lived in Cazenovia, a small town in upstate New York near Syracuse. I started improvising and composing with the electric guitar at age 13, and was primarily self-taught until the age of 17, when I met organist and composer Bette Kahler. Adam, 14 or 15 years old, playing in an arrangement of Jimi Hendrix's "Red House" with the high school stage band in Cazenovia, NY. Bette helped me fill in some gaps in music theory, composition, and musicianship, and under her guidance I began to seriously study classical guitar. I initially enrolled at Oberlin Conservatory as a music composition major. Soon after, I switched majors to classical guitar. Like many students at Oberlin, I had a multiplicity of interests; eventually, I graduated with a B.A. in English and accepted a scholarship for graduate study in music composition at the University of Illinois, Champaign-Urbana. In my final year at Oberlin, I developed an interest in formalized composition. I used algorithmic procedures to write a guitar trio, which I performed with colleagues from the guitar studio, and an orchestra piece that was recorded by the Oberlin orchestra. To realize these pieces, I had laboriously worked through the algorithmic processes by hand. I made it a priority at the University of Illinois to become proficient at programming computers to realize my ideas. Rick Taube, author of the algorithmic composition system "Common Music" was my mentor in this endeavor. At the completion of my Master's degree, I had some software development skills, mostly in the Common Lisp language (see "The Roots of Lisp"), at the peak of the '90's dot-com bubble. I decided not to continue immediately with a doctorate, and instead took a position at Curl Corporation (now SCSK Corp) in Cambridge, Massachusetts. Curl was a small MIT spin-off in the process of developing a new programming language for the web. I spent four years there, writing test applications for the graphics component of the language and building GUI tools for Curl code development, until the company collapsed shortly after September 11th, 2001. During my time in the Boston/Cambridge area, I met Joe Maneri. Joe, a saxophonist, composer, and improvisor notable for his use of 72-tone equal temperament, was in his 70's at the time, and still teaching at the New England Conservatory. Joe held a regular informal improvisation session with a few former students at the school and at his home, and I was invited to join by one of the participants, Curtis Hughes, a friend from Oberlin. Spending days programming for work and nights programming algorithmic music was taking a toll, so I took a pause from algorithmic music and spent the next few years cultivating my ear and guitar chops with Joe and the musicians in his orbit. Joe encouraged my interest in microtonality, and convinced me to get my first fretless guitar. The fretless guitar became my primary instrument for the next 20 years. 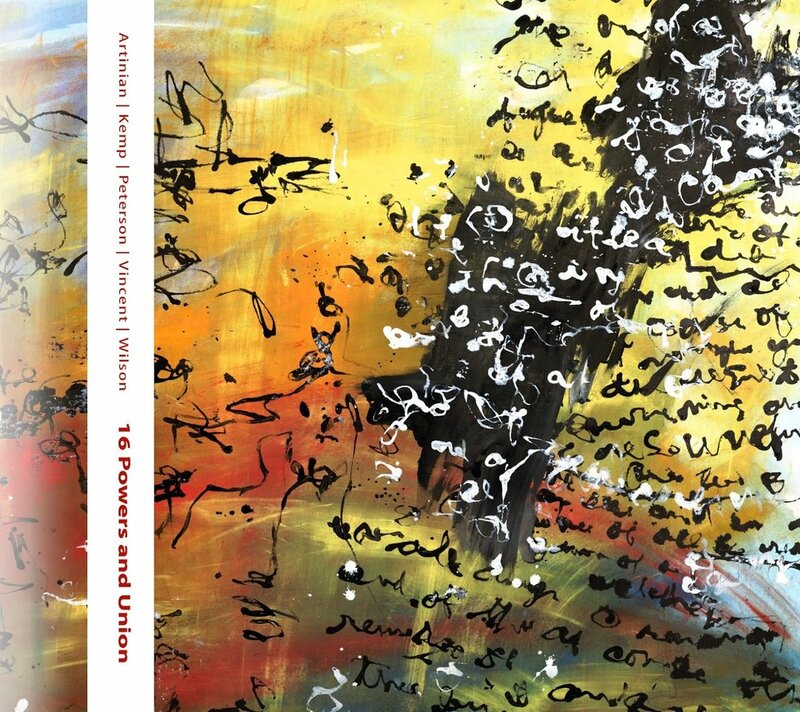 I performed with a number of groups in Boston, and made three full-length records of collaborative improvised music (Unify, Zond, and Darker) with Boston musicians Aaron Trant, Jonathan Vincent, Katt Hernandez, and New York flutist Arto Artinian. I released all three records on my own micro-label, Stone Quarry Records. In Boston, I performed variously on the fretless electric guitar, the 7-string electric violin, and a replica of Harry Partch's 88-stringed "Harmonic Canon I," which I had started building at Oberlin and then completed while at the University of Illinois. 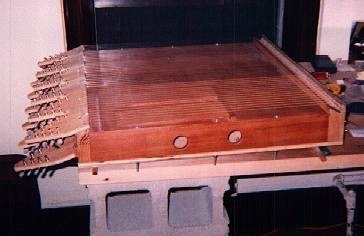 Adam's home-built replica of microtonal composer Harry Partch's "Harmonic Canon"
Harry Partch designed the Harmonic Canon some time before 1947. Like his other instruments, it was made to be used with his 43-tone-per-octave just intonation scale. The version I made, his first version, has 88 strings - 44 horizontal strings and 44 angled strings. You can play both sets separately or together where they intersect. I believe Partch used plectrums to play it, but I used hammer dulcimer hammers. Dean Drummond had all the original Partch instruments at SUNY Purchase back in 1997. He let me visit and take measurements so I could build my own, which I completed in 1998 or 99. Early in 2002, not long after the demise of Curl Corporation, I made my way to New York City to join my primary musical collaborator, flutist and composer Arto Artinian. Bolstered by a small severance and a couple of short-contract programming gigs, I was able to spend the better part of a year performing improvised music in the city, living frugally in a Brooklyn warehouse with other musicians, artists, writers, and dancers. Running low on money in the fall, I began teaching high school in the Bronx, in Co-op City; Arto had a job there as a history teacher, and introduced me to the principal. I started teaching part-time in an after-school literacy program, and eventually transferred to John. F. Kennedy high school as a full-time English teacher. During my three years in the Bronx, I continued performing and recording, releasing two more CDs: 6000 Degrees Kelvin, featuring sax virtuoso Antoine Roney, and 16 Powers and Union, featuring Randy Peterson, whom I knew from his incredible drumming in trio with Joe Maneri and Joe's son Mat. My interest in algorithmic and formalized music had never really abated, and I was beginning to realize that the speed of consumer microprocessors had reached the point at which many of the algorithmic processes I had formerly used to generate static musical scores could be now used to generate and synthesize music in real-time. I saw a way to combine my love of improvisation with formalized musical systems, and realized that I needed to go back to school to do the research necessary to make it happen. I quit my job in 2005 and enrolled in the doctoral program in music composition at the University of California, San Diego. I entered the program explicitly to develop a system through which my improvisations on guitar could inform pre-programmed generative algorithms in real-time, making the computer a kind of guitar-controlled ensemble with some possibility for manifesting it's own computational creativity. An important mentor at UCSD was Miller Puckette, author of the Pure Data and Max/MSP graphical programming environments for real-time audio processing — much of my work involved developing libraries for those platforms. Miller, also a guitarist, was an invaluable guide during the development of my doctoral thesis, which was carried out at UCSD's California Institute for Telecommunications and Information Technology. The thesis project took the form of an improvisation system in which networked computers responded to and elaborated my playing in various ways, through synthesizers and a collection of 32 percussion-playing robots (Watch a video of this project in performance at "The Duoquadragintapus") [Stephen Aron notes: this has to be seen to be believed. It is incredible]. Adam performing with robot percussion array in Duoquadragintapus. Upon completing my doctorate in 2009, I headed back to New York City, hoping (but not expecting) to find a university position where I could continue my work. Shortly after returning from San Diego, my (now) wife Marla, whom I had met in San Diego, joined me in New York (inexplicably choosing to do so despite having been fully exposed to my music). In the midst of a recession and unable to land even adjunct work, I returned to software engineering, working initially at a startup company, Temboo, helping to develop an API-integration platform, and moving to Medidata Solutions, where I worked on full-stack web applications for the pharmaceutical industry. In 2012, Marla and I got married. In 2013, anticipating our first child, I got a call from a friend with a tip on a job at CUNY City Tech; they had been unable to move forward with a candidate and were at risk of losing a tenure-track line. They were looking for someone to cover a position in the Emerging Media Technology program, someone working at the intersection of arts and engineering. Luckily for me, quite a few of the faculty had backgrounds in music. In 2013, I re-entered academia as an Assistant Professor in the Department of Entertainment Technology at New York City College of Technology (City Tech), City University of New York, where I now coordinate development of the Media Computation and Music Technology concentrations for the Bachelor's degree in Emerging Media Technology. City Tech resources enabled me to create a venue for other musicians interested in combining improvisation and computation. 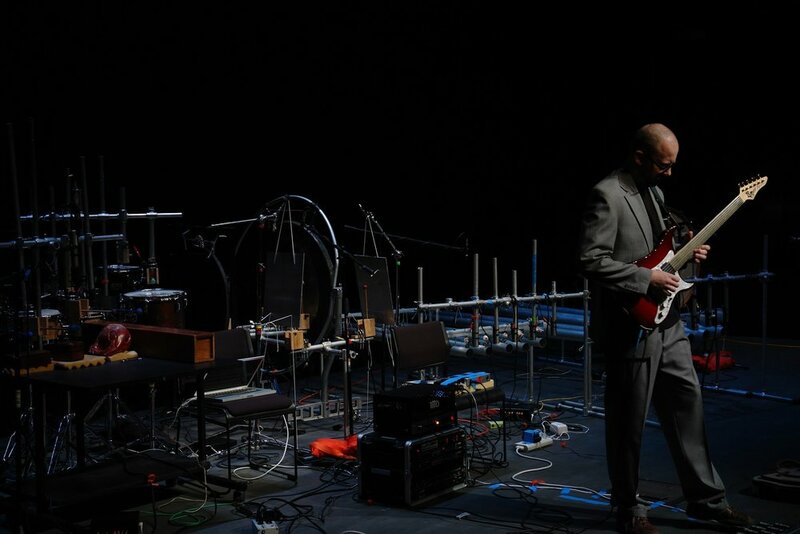 In 2016, I co-founded the New York City Electroacoustic Improvisation Summit, which is held each year for two evenings at New York City College of Technology in Brooklyn. NYC EIS is a concert series featuring music by artists focused on the integration of music improvisation and real-time interactive computer systems. Some of the world's best-known electronic musicians have participated. (See: review of the 2016 NYC EIS from the International Computer Music Association's *Array* magazine). Since returning to the city, I have had a chance to refine my improvisation system many times. I have performed or presented my music in Tokyo, New York, Paris, Montreal, San Diego, Washington D.C., Boston, Belfast, Baltimore, Atlanta, Palo Alto, and elsewhere. Last year, with Arto Artinian, I wrote a philosophical justification for algorithmic enhancement of improvised music, published by the MIT Press. Our daughter Nina, now 4, shows no signs yet of being interested in playing the guitar. According to Nina, her favorite instrument is the microphone, which can at least be connected to a computer. Who knows where that will lead?" Congratulations, Adam, on your numerous and varied accomplishments. I wish you and your family every success as your lives together move forward. Thank you so much for sharing your story! !